Vincent Van Gogh was one of those artists who brought the fullness of his unique character to his lifestyle, his relationships, and his artwork. His personality was intertwined with his creations, and his creations were an outpouring of his personality. Van Gogh in Provence: Modernizing Tradition by Sjraar van Heugten pulls together a subset of Van Gogh’s paintings, sketches, and letters that hint at different aspects of his personality and how it shifted his approach to painting. Van Heugten illustrates how, in the short span of ten years, Van Gogh built upon the traditional methods of the art of the masters he admired and expanded into his own unique style. Van Gogh in Provence: Modernizing Tradition is, at its core, a catalogue presented by the Foundation Vincent Van Gogh Arles. During his almost two years in Arles, a bustling hub in the heart of the Provence region of France, Van Gogh was inspired to create 200 paintings, over 100 drawings and watercolors, and kept frequent correspondence with his younger brother, Theo. He was so taken with Arles that one of his dreams was to establish an artist colony there where kindred creatives could come together to study in and be inspired by the landscape of that region. In 2014, the Foundation Vincent Van Gogh Arles was able to fulfill this dream. They secured a home base building, thus establishing a permanent presence in Arles, and embarked on a three-year exhibition schedule. 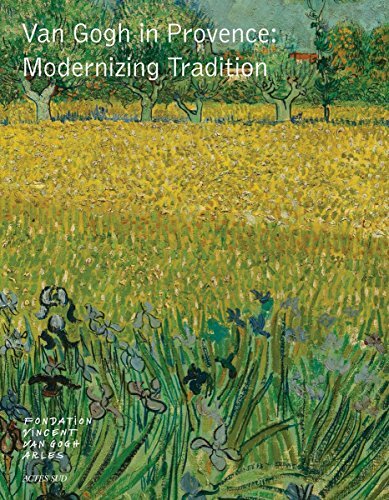 Accompanying the launch of each exhibition, the Foundation produced catalogues, or retrospectives, on different themes, curated to coordinate with the selected Van Gogh works on display. The exhibition’s retrospective catalogue of 2014 was titled Van Gogh: Colours of the North, Colours of the South. In 2015 it was Van Gogh Drawings: Influences and Innovations. All three exhibitions and catalogues were, incidentally, curated by van Heugten. Thirty-one Van Gogh paintings are compared and contrasted in the collection of Van Gogh in Provence: Modernizing Tradition. Van Heugten begins with the earlier works from 1883–1885 made in dark neutral tones of gray and brown. Full page replications of Farm with Stacks of Peat, Loom with Weaver, Avenue of Poplars in Autumn, and Still Life with Apples and Pumpkins along with a select few figure paintings, greet the reader for 20 pages at the opening of the book. The message is clear, Van Gogh was intimidated by color and was not entirely confident in his delivery of the figure. The Van Gogh letters from the same era, which are strung together by Van Heugten, support this theory as well. As a few years pass, Van Gogh travels around different countrysides, stays in Paris, continues to view the works of the painters of the day, and gets ahold of more paint supplies. His works begin to shift. His paintings from 1886–1887 demonstrate a more tentative use of color paired with bolder brush strokes. Self-Portrait with Grey Felt Hat, Roses and Peonies, Flowers in a Blue Vase, Café Table with Absinthe, and Portrait of Père Tanguy are offered as evidence of this shift. While this catalogue is full of interesting connections, thoughts, commentaries, and a succinct listing of the included artworks, it would benefit greatly from more obvious organizational standards such as a table of contents, an introduction that references the 2014 and 2015 exhibition themes, or even a title heading at the very beginning section which starts out of nowhere on page 25. Perhaps a map of Van Gogh’s varied locations would help to organize the content, which jumps around as maniacally as Van Gogh, from geographical locations, to subject matter preferences, to the Modernizing Tradition theme . . . and is a bit tricky to follow. What is noteworthy about this particular collection of works is not that it is any truly new information about Van Gogh, but rather that it outlines a fresh take on the growth of artistic liberties that Van Gogh felt compelled to develop. Van Gogh was not content, indeed he felt himself inadequate, to maintain the norms of the masters he admired: Rosa Bonheur, Jean-François Millet, Jules Breton, Jozef Israëls, Rembrandt, Frans Hals, etc. Clearly Van Gogh was equally a master, but it took his strong personality to have the courage to go his own direction.